Found this on Ebay. Was a no-brainer to add this private custom 78rpm to the collection. Kinney Recording Service disc. Found a few other pieces from the same outfit, including a 45 from Denver East High, and this red vinyl release from the Sterling ISD (Elementary, Junior, and High School concert). A Google map search of 766 Marion Street, as noted on the label, finds a four bedroom near Cheesman Park. Records from the 1940s show Harold and Margaret Wunderwald lived there. What their affiliation is (or isn't) to the Kinney Recording Service is anyone's guess. 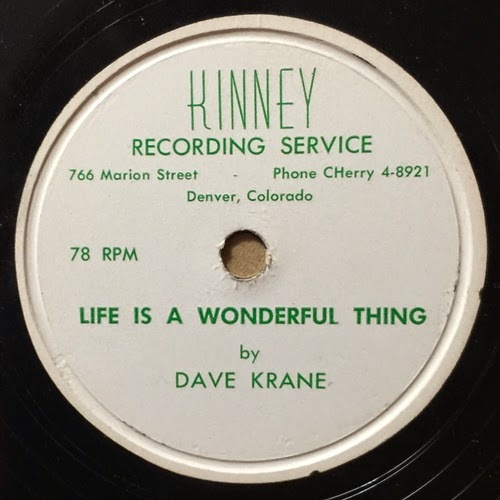 As for Dave Krane? No clue. Can't find a thing on this guy. I look to the readers for help solving this mystery. Monty Baker and the Trolls, in pictures.